Message #1 Posted by Andrew Nikitin on 18 July 2013, 11:29 p.m. I finished formatting the preliminary version of my WP 34s pocket reference. It is mostly based on IOP from the user manual and list of catalogs. I may include alpha keyboard layout if I get to make it. It still requires some radical editing -- this is just to see if the reference can be made comapct enough. So far, it has 78 pages -- on a thick side of pocket reference, but still pocketable. DSE skips on less than or equal to not just on equality. Likewise for ISE which skips on equal to or greater than. Lnalpha, takes alpha in Z, n in Y and x in X I think. It would be nice if the commands that are available in a complex version are indicated somehow. Pauli, thanks for the comments. I marked opcodes that are available in complex with small grey (CPX) key icon. What do you mean? To big? to small? too many pages? Put the exponent higher in texts, e.g. in 10-n.
x -> r should be used more consistently - compare e.g. 1/x and ABS or ANGLE, COMB and COS. If you write g HYP-1, why don't you write h P.FCN? Use of formulae could be more consistent - compare e.g. Binom and Bn. Edited: 19 July 2013, 2:53 a.m.
Good point, for some reasons superscripts look kind of low. I could not figure out how to do with a single setting for entire document. Alternative is to go through each case and adjusting offset manually. Or typesetting all numbers with exponents as formulas. I will see how it will look on paper. (h) in (P.FCN) is implied. True, (g) in (HYP-1) is implied too, but -1 in HYP-1 label is small and dark. Also, HYP-1 is used only for 3 functions which are themselves not really popular. I thought it is good idea to keep (g) as a reminder. IMHO, a pocket reference is a pocket reference is a pocket reference. Quoting formulae selectively is highly personal - neither just nor consistent. For space reasons (and since you quote App. I anyway), I suggest you refer to App. I for any formula printed there. At the bottom line, consistency rules. Very, very nice! Love it! Thanks! Will there be a foldbook version again? Yes, there will be a foldbook. I was going to make one when I finish editing. Or, do you want to try to print it as it is? For formula print, please see my previous post above. ... x->theta if the result is an angle - which is just a plain real number on the WP 34S. ... x->p for Binom - the result is a plain real number as well. ... x->p for Binom-1 which is plain wrong. ... m->m for BC? and m->r for CB and x->r for CEIL, although the result is an integer in either case. ... - -> 0 r for cCNST; your stack sequence t z y x confuses me - I'd suggest x y z t instead, especially since you omit the higher levels here. ... dc->d for DAY - I've expected dc->n here. I guess dc means "day code" here but you never explain. Also day codes are just plain reals. ... m->m for BC? but - -> - for DBL? I stop at DBLR since it goes on and on. Please check. I suggest to KISS. I suggest you look up how stack diagrams are used in Forth. Thomas, you didn't get the point - it was in the part you omitted ;-) And I didn't say it's wrong - it's simply confusing the way Andrew used. So you're familliar with stack diagrams and still think ( m -- m ) for BC? is confusing? Because to me the stack diagrams are crystal clear the way they are used in this pocket reference. Your question implies that you either don't know or don't understand how stack diagrams are used in Forth. That's why I suggested you look it up. This was meant as an answer to both: your statement that they are confusing as well as your suggestion to change the order of the sequence. PS: For the specific question just look at Andrew's explanation. Edited: 21 July 2013, 12:38 a.m.
Walter, here are some explanations for the notation choices I made. I use theta to indicate a value that is interpreted based on angle mode. I use it instead of generic x or r to alert reader that result may vary depending on mode. ... x->p for Binom - the result is a plain real number as well. ... x->p for Binom-1 which is plain wrong. m->m means that BC? does not change the stack. m instead of generic x to indicate that this is integer mode command. More consistent way would be x->r, yes. But n makes more sense to me in this context. I use dc to alert reader that this value is interpreted based on date format. This is to indicate the fact that result of BC? depends on the value on stack even though BC? does not change that value, and DBL? does not depend on stack at all. Edited: 21 July 2013, 1:24 a.m.
Thomas, thanks. Those were typos and meant to be "y x", just as you noticed. If you can find a way to put page numbers in this document, I think that would be helpful. Thank you for helping the community out in this way. This is great! Re: Great job Andrew...one suggestion? That might be confusing as currently references to the user guide are used, e.g. in CNST to p. 134. Personally I'd refrain from doing so. I don't need to reference pages. So it only adds clutter. the page numbers mentioned in the text are vestiges of the original IOP and refer to pages in owner's manual. I plan to remove them eventually, as this is not intended to be an index for the manual, but a standalone reference. I tried to add page numbers but this increased page count by 9 because page numbers ate up a lot of page height. (Yes, I was surprised myself that it was that much). Right now I do not have any index or table of contents, so nothing would reference these page numbers, even if they were there. Next iteration, foldbook and cover page. Total page count is 72 pages without cover. I printed the foldbook as a single booklet and it is on a thick side of "acceptable". (Still thinner than a calculator itself). It would be nicer if it was printed on a book paper, but laser printer paper is quite a bit thicker. I will clamp it overnight and see if it is going to stay folded. If not it will have to be split into 2 subbooklets. Since it is intended for pocket, it needs cardboard cover. The first page is just too valuable real estate to waste it on title and authors name only, so I put alpha keyboard there. Any other suggestions for front and back page? It is a quick reference guide, I wouldn't put anything superfluous in it. You've already skipped page numbers. A title and author's name aren't really required either. Likewise some of the descriptions could be shortened. E.g. the Gudermann functions would suffice saying Gudermann function and its inverse. Sure the integral formulas are nice but unless you know what this function is and what it is for you shouldn't be casually using it. If you do know about it the stack diagram will be sufficient. There any many other possibilities to shorten the text without losing usefulness. I like the way you added CPX to complex capable commands. Doesn't occupy any more vertical space and is sufficient for the purpose. Title page: I vote for the colour version although h is a bit elevated ;-) The square character is actually a center point used for multiplication in large areas of this planet. The menu contents are presented better on the b/w title IMHO. P. 2: Why waste a whole blank page? You could use it for introducing your stack 'diagrams' which are not self-explanatory. Formulae: still a random (personal) selection, please see my earlier suggestions. Probability distributions, e.g. Binom: Binom and Binomu return a probability, Binomp returns a probability density. Please correct also for the other distributions. DBLR and DBL/: Now you print "lo hi i" in your stack 'diagram'. Why not "lo hi m"? FILL: Looks like the explanation of cFILL is incomplete. LJ: Now I'm ko :-? Compare RJ. Once again: please explain your stack 'diagrams' or print a link to a good consistent explanation of the notation for toddlers. What do r, i, m, k, o, ... represent? Also seems r is used in at least three different meanings which should be avoided. MIRROR: Why not "m -> r"? M.COPY: Why not "mat i -> r"? Compare M.IJ. Norml: Looks incomplete. Same for Pois[lambda]. Please compare s, SERR, and SERRw. Stack 'diagrams' are suggesting sx is recalled in all those which is wrong. Compare also sw. x[bar] etc. show an alternative. SHOW: [<] and [>] are independent labels with no connection to SHOW here. Compare the stack 'diagrams' of Tn and Un. Should be identical, shouldn't they? XEQ and XEQ[alpha] look incomplete - no diagrams. x->[alpha]: Why not x -> x here? Compare y<>s and z<>s and t<>s. Should look equal. Phi(x) and Phiu(x) should return p.
Please look for a proper letter for lower case phi. (-1)x shall look this way. +. -. * are missing. Compare e.g. the stack 'diagrams' of >DEG and DEG>. Consistent? Enabling hyphenation may save a page. Not sure I found everything. Rats! Nobody's perfect. Edited: 21 July 2013, 7:08 a.m.
Walter, thank you for the reports and suggestions. I implemented most of them. I am not sure what black-and-white title page you mean, I submitted only the color title page. And now when I reuploaded I cannot figure out what you mean. About formulas. The formula is the most compact and precise form of function definition, that is their main intention here. Sinc could be normalized or unnormalized, standard deviation could be named differently but not quite in different language, you may remember what gudermannian is, but not quite sure which is forward, which is inverse. Formula answers all that with very little ink. Same applies to distributions too, but in practice they are known only by their names anyway. Also, you did not include all of them in the Owner's manual, and you were not pressed for space. I may add them later if I manage to edit the text down further. The reason for blank second page is that I want to keep title page and main body together in one file. Word treats even and odd pages differently, and I want to keep main body of the book in sync with that. The title page is printed using different process on different paper. In my case, my book body is all black and white (with some grayscale), but title page features some colors and printed on thicker paper. So the blank page is just a separator between 2 different objects (intended to be printed separately), that keeps second object (main body) true to even/odd page relationship. In anther words, this page is intentionally left blank. "Consistent" way would be to write "ry rx" or "y x", but "sy sx" makes more sense to me in that context. Labels in stack diagrams are just that-- labels. Entry text is where the definition resides. Also, epsilon. Working on it. Isn't that what it looks like already? Indeed. Not sure how that happened. However, i might keep them out. Keeping "/" can be justified for having visually different keyboard key and reference to IDIV. What's wrong with those? I do not see anything. I enabled hyphenation, but it did not give me anything, so I disabled it back. I consider the title of the book, author's name and a date very important information. All three should be displayed prominently on the cover. If you have more than one book, you should know why I feel this way. Edited: 21 July 2013, 4:16 p.m.
on your new version, I vote for swapping R^ and TEST menus on the title page for better readability. Labels in stack diagrams are just that-- labels. If they really are then they should add clarity not confusion. Who or what forces you to use m, i, k, and o for integers without any relation to the input variables? One letter would do. Why print sx and sy at places where it's just plain wrong? I appreciate the use of n in input but why don't you employ it also in output e.g. at nSigma? :-? Very, very nice Andrew, thanks very much for creating such a useful additional tool for those of us learning the 34S!. Once it settles down to 'final' (as if...) I'm curious if anyone has contacts to have such a pocket guide printed? I would happily buy a couple. Most of the historical companies that made such things in the calculator world are gone, but I'm always amazed at how resourceful this group can be. I will investigate if they can do the pocket size. I would look to other services of same kind if any members here care to recommend one. I made few corrections (mostly Walter's comments) and a few additions (CAT browser description). There is no file update, since more changes is coming soon anyway. Only thing is missing is flags description and a picture register name/numbers layout. To reduce space further I want to drop all references to other calculators. They do little to me (I don not have none of them), other than tell me that that feature is present on that calculator. Will anybody miss those references if I remove them, or do you think that they provide valuable information? I printed first prototype and it seems usable so far. A lot of things became apparent after printing. One thing, I misjudged width. It will not fit easily into the pouch (with calculator removed). It fits in most pockets, but not all -- I have a pocket which holds calculator without pouch, but not calculator+guide. Also, If anybody with iPhone or large screen android could try to view the .pdf file and report on legibility or lack thereof, I would appreciate that. Will anybody miss those references if I remove them, or do you think that they provide valuable information? Maybe a little but mostly for nostalgic reasons: when was the last time I used ATOX in a program? OTOH who needs the German translation of GCD and LCM? The legibility on the iPhone is very good. One suggestion: if there is an easy way to create links from the catalog to the descriptions then I'd appreciate to move the catalog to the beginning. Sometimes I don't remember the exact command so the built-in search is of little use but if I see them all together I can spot it. There's an easy way to scroll to the beginning of the document but I'm not aware of a possibility to scroll to the end. who needs the German translation of GCD and LCM? Oh, it only helps us oldies a bit who were raised learning our mother tongue instead of SNIPE (i.e. Surely Necessary International Pidgin English). Here is what prototype looks like. It is quite thin, even with thick cardboard cover still much thinner than a calculator itself. It turns out just about a quarter an inch wider than what whould have fit into the pouch. I am thinking about redoing the layout to make it narrower. You can play with the margins: currently you have the same left and right margins on each page. If you define your document as having multiple pages or being �book fold� (depends on your authoring tool), you should be able to set different values for the inner margin and the outer margin and reduce the overall width while keeping the impact on the content layout minimal. Btw, great job!! I'm looking for a printed version to be the companion of my WP 34S. Edit: Here is my 1st attempt to get a printed version using standard laser printer paper. I should be able to get a better result with lighter and slimmer paper for the inside and stronger paper for the cover. Edited: 25 July 2013, 12:44 p.m.
Didier, thanks for the pictures. Could you, please, make some measurements for me? What is the overall width of your cut book (from spine to edge)? How wide is the outer margin on the middle pages (those on the inside that stick out the most)? Finally, are the small gray (CPX) markers visible? They are barely visible on my printer, so I might be making them darker. The standard is "24 lb" paper and it is too thick for my taste, but his is the one I used too, because this was the only kind around the house. I plan to visit stationery store over the weekend and see what they have there in terms of density and thickness. Edited: 25 July 2013, 7:46 p.m.
Andrew, the overall width of my book is 7.3cm (~2.87") at the top and 7.6cm (~2.99") at the bottom because once stapled I had some trouble to cut it straight... I first printed your pdf file to two intermediate files (one for the cover and one for the inside) in booklet mode and using a custom page size of 6"x5.5", I printed the two files on a standard laser printer, then I folded separately each page, stapled the whole book and tried to cut it at the intended dimensions (3"x5.5"). There is almost no outer margin on the middle pages. Here are some other (and better) pictures showing the inside, I confirm that the (CPX) marker is barely visible. Update on the book: I am almost done editing. I am down to 69 pages. I have come up with some variants for the cover page. There are 2 ways to layout keyboard table -- with catalogs "around" the keyboard and with catalogs simply listed under it. I started with "around" version because I thought it is nice when catalog contents is listed near the key it is on. But the catalogs listed under the table just look so much neater. Also, for the printed book I would like a black cover s stay in sync with keyboard sticker, but I will keep the white cover in DIY version because printer toner will probably not hold too well when it is in thick layer. My preference goes to the second cover: white with the catalogs under the table. I don't find the black version very legible. One note: in the R^ catalog the -1 exponent is missing. The latest version of the file available via the link at the top of this thread has 72 pages. The command catalogs are at the beginning but I don't like very much the layout of page 6 with the WP 34S commands starting at the bottom of the page, I would prefer to have it at the top of the next page. On the last page you just have the copyright notice, I think you can also put the ON Combinations on this page. Also one thing that I would like to find in a pocket reference guide is a memory or register map. Maybe on page 2 which is currently blank, if you find a way to fit one for the WP 34S. Edited: 27 July 2013, 3:55 a.m. Here is my second try. This time I've done the cutting right: the overall width is 7.4cm (~2.91"), slightly below the 3" from the pdf document to ensure an easy insertion/removal in my WP 34S case. I've also done some manual imposition to compensate for the page creep: I've manually cropped each page (alternatively on left and right side), with a cropping value ranging progressively from 0mm for the cover pages to 4mm for the pages on the center sheet. This way, inside pages have their inner margin reduced to keep the outer margin. The 4mm value comes from the 8mm width difference I measured between the cover sheet and the center sheet on my first printed booklet, it's directly linked to the paper thickness. However this cropping is not reflected entirely in the booklet: it seems that in the process of printing the cropped pages to a booklet pdf, the pages have been centered within each half of the 6"x5.5" custom page size, rather than aligned on the middle, and the outer margin on the middle pages is lower than on the first/last pages. I made what I believe is final version of the pocket reference. I reduced margins and page width so it can be cut to 7.3 mm (which seems to be enough to fit into the HP30b pouch together with a calculator. Even though it fits, taking out the calculator and putting it back in is not as easy as without it, so it should probably just stored there when the calculator not in active use. I have also added some content: list of constants, descriptions for CAT and STOPWATCH, STOM/RCLM settings internal bit assignments. I have not come up with a picture of memory map that I was going to put on a back of a cover. I kind of wanted to fit single and double mode and show what happens during switch, but that seems to take more time than I am willing to postpone the release. I made the (CPX) marker for complex variants darker, but it still seems too light when printed. There is a laid out version for printing on US letter for the internal block of pages and the cover, separately for printing on a cardstock, preferably in color. I have not implemented Didier suggestion to increase inner margins for pages that go on the outside of the book to account for thickness, but it still turned out reasonably ok without it. Since US letter is hard to come by in some parts of the world, I would also like to make an A4 layout. The book's page height is 5.5", exactly half of US letter. A4 is taller, so there are 2 possibilities -- to place each book page in the middle of respective half page, or along the bottom. Which way would you prefer? I had a breakthrough with memory map picture. I think I figured the arrangement that I like. It is nowhere near finished formatting-wise, but all the content I intended to include is there and basic arrangement is what it is going to be. I am not sure about color. It is colored mainly because it goes on the back of the cover and cover is in color already. The color legend is: various shades of beige is stack related, light green is used by distribution functions, gray text is volatile, blue is user flags with special meaning. I take suggestions on better use of color. Looks nice. The colours will need a key, they distinguish the various uses but don't describe them. Also, it might be worthwhile looking up a set of colourblind friendly colours and using them instead. Excellent!! Your memory management diagram is much better than what I've tried to do on my side, it packs a lot of data in a clear and visually well organized picture. Maybe you should show also the mapping to the sectors described in Appendix B: Global Registers, Summation Registers, Program steps and SRS. I don't understand where 982 comes from. If I understand well, there is a total of 1024 words of RAM, divided in 4 sectors. The first one, Status and Configuration data uses 88 bytes or 44 words, which leaves 980 words for the remaining 3 sectors, so why do we have 982 in the formula above? I like the additional content in the latest version of the pocket reference, as well as the printer symbol prefix replacing the square in the previous versions. The (CPX) marker should definitively be darker for printing. The margins and page size are now matching well with the cut booklet pages. For A4 layout, having the pages in the middle rather than along the bottom is fine for me. 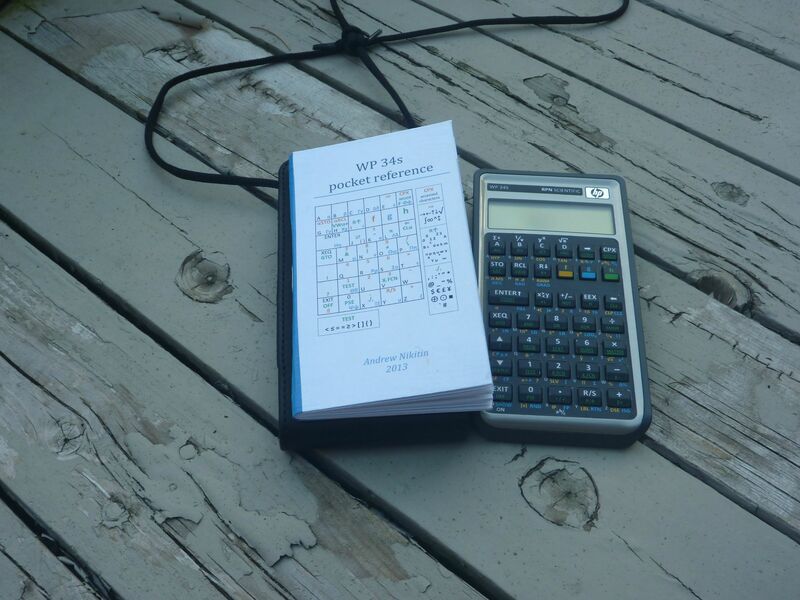 Edited: 7 Aug 2013, 9:47 p.m.
Didier, I count 40 fixed words for the calculator state, not 44. It's some time ago I computed the famous 982 and I no longer know exactly what the exact computation was. There is at least one word on there return stack at all times. Maybe 983 or 984 is the exact value but who cares? 982 is the correct number - that's easily checked with the emulator or the calculator itself: startup default settings result in 982 - 448 - 1 = 533 free words in program memory (compare p. 176 in the printed manual). In consequence, 1024 - 982 = 42 words = 84 bytes must be reserved for status and configuration data (compare p. 173). Therein, 30 bytes are for alpha, 14 bytes for the 112 flags, 8 bytes for modes, and 32 bytes for whatever (Pauli or Marcus should know the latter). Edited to correct the error Pauli found. The modes are 8 bytes not 4. The details of the RAM use are in data.h. Thanks! I corrected that figure. Thanks for the detailed answers, I'm currently away from my printed manual and in the pdf manual the Status and Configuration data is said to be 88 bytes, hence my question. Anyway it's not a big deal, but as I was trying to build a memory map for the pocket reference I had troubles to match the different numbers from the manual (pdf version).